With the wind up and a forecast for building conditions, the team opted for an early dock-out. In fact, the light had just filled in behind a grey, overcast, sky as the USA slipped its mooring. In a very cool departure, the boat simply drifted downwind, backwards, several hundred metres from its mooring, before making a quick bear away, and powering up in the flat water of the port to fly past the breakwater. Once at sea, the plan was for some upwind work, and that's exactly what they did. With the wind hitting 22 knots, it was a day to see what the USA, and it's wing sail, could do. "The wing, upwind, is a beautiful thing," said main trimmer Dirk de Ridder (NED) after sailing. "It's so much easier to trim. Everything gets easier when it's windier as the whole head just lays off. You ease it out and off she goes. "We did a few tacks upwind and a bear away, which at these windspeeds people always say is the most dangerous thing to do. When you see a spectacular picture of multihulls it's always on the bear away, but that went really well - really easy - which is a very good sign for us. "Then we did a little bit of downwind with just the wing, and we were in the process of putting a jib up when we had an engine problem, which affected power to the winches, so that's how we finished. 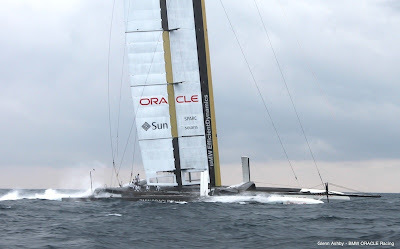 It was a shame not to sail all the way back downwind, but it was a really good upwind session today, so we're happy." So a small electrical issue ended an otherwise successful session. "We had bigger conditions in San Diego, but most times there it was choppy and lighter winds," said bowman Simeon Tienpont (NED). "Today, the boat was really fast, it felt really good." The fast part, I can confirm. Trying to keep up in a 6-metre RIB was more or less impossible with the sea state. What was amazing to me was how stable the USA was in the chop, using her waterline length to slice through the waves like they weren't there.